No Minnesotan’s summer is ever bland. We have three short months to cram in as much outdoor warm-weather living as we can. This summer, I’ll be on the water, in the classroom, on the mat (yoga), and field-side cheering for at least four different sports teams. Thankfully I’m only coaching one of them! I’m grateful for all my marketing students who sacrifice a warm summer evening to spend 3.5 hours mostly inside with me at St. Catherine University. Maybe it’s the yogi in me, but I learn so much from my students–especially in the summer–because I know they want to be there and that they sacrifice sacred summer free-time to be with me. 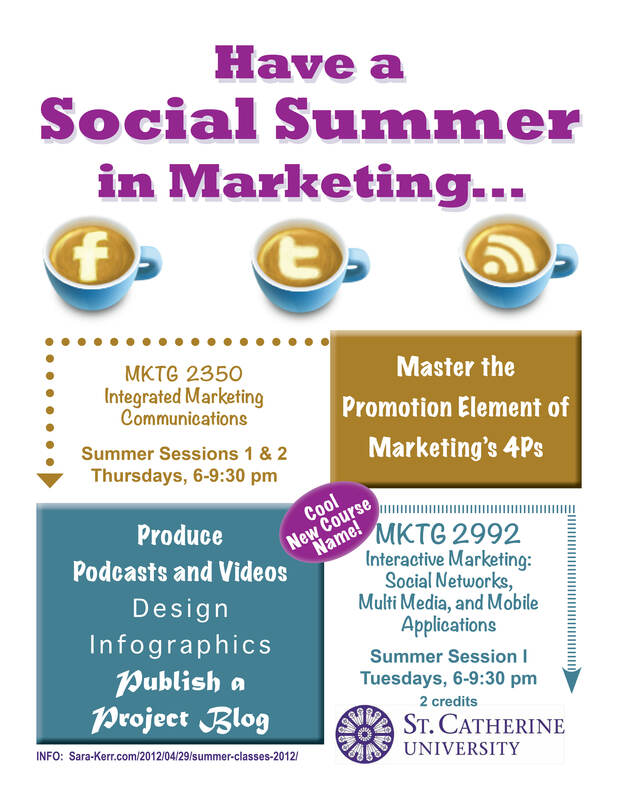 This summer, I’m teaching an awesome new class entitled MKTG 2992 Interactive Marketing: Social Networks, Multi Media, and Mobile Applications, which is a 2-credit topics course. This is a hands-on course. Yes, we have a text-book, but the majority of our time we’ll produce podcasts, publish videos, and dive into the interactivity of multimedia marketing. What, pray tell does “the interactivity of multimedia marketing” mean, you might ask? It’s the idea that there are thousands of social media tools some with broad and some with narrow applications. Today’s marketer must both produce content for popular tools such as Pinterest, Twitter, and Facebook and know about application development, infographics, and the next big thing on the horizon (Prezi.com anyone?). citizen, subject, national mean a person owing allegiance to and entitled to the protection of a sovereign state. citizen is preferred for one owing allegiance to a state in which sovereign power is retained by the people and sharing in the political rights of those people citizen>. As citizens, we have responsibilities. As social media producers and citizens, we must honor intellectual property, copyright infringement, and civil discourse. We’ll hit this subject hard and heavy, as well. I don’t want any of my students to receive a “cease and desist” letter because of something they published. Interactive Marketing: Social Networks, Multi-Media, and Mobile Applications meets on Tuesday nights during Summer Session I (June 5th – July 3rd). Capped at 12 students, this class will fill up soon. Register today. I also have the pleasure of teaching Integrated Marketing Communications (MKTG 2350), from June 5th – August 9th. This is one of my favorite classes to teach. I developed it in 2010 after a fun stint of technology consulting in North Carolina. In this class students master the promotion element of marketing which includes advertising, public relations, personal selling, sales promotion, and direct marketing. Interwoven throughout this class is the mulitplicity of social media. “Multiplicity of social media?” Is Facebook direct marketing? It fits that definition, but what about Facebook Ads? How about Pinterest, is that public relations? or is it sales promotion? or both? See what I mean? Social media bring a new dimension to classic IMC theory. Please note the fall section of this class is full. The confidence I developed in sharing my voice online – that others might think what I have to say is worth the investment of their time to read. The interest I’ve developed in Marketing itself. I am beginning to believe I have untapped talents for marketing and selling that I can leverage in my next career step. The personal fulfillment that results from developing friendships and network relationships with the peers, professors, and speakers from the class. As part of your coursework for this class you are required to write an IMC plan, in a safe, non-threatening environment (a much better way to go, then having your boss ask you to write one and not having a clue). This plan includes familiar sections like: Company Overview, Marketing Segmentation, SWOT and Marketing strategies and tactics, but it also includes sections like: Media strategy, a Creative Brief, an Interactive and Social Tools section which highlights what social tools you will be using and why, followed by a time-phased spreadsheet that culminates all this information together. When we met for the first time the thought of writing an IMC plan was a daunting thought for me, but Sara (Sara Kerr), breaks up the process in several manageable steps so, at the end, you are impressed and surprised with what you have created.